Dung beetles are important insects who help to break apart the large mounds of dung produced by large animals. They go to a pile, make a ball, and then head for home as fast as possible to try and keep other dung beetles from stealing their hard-earned treasure. The best way to do that, of course, is to make a bee-line for home. Being a small insect in a big world, dung beetles use visual clues to help go home. Previous researchers found that dung beetles use the sun, moon, and polarization of the light in the sky to orient themselves and move in a straight line. But the beetles still work if the sun and moon aren't in the sky. Dacke and her collaborators tried to figure out what else the beetles might use to orient themselves. They made a little arena for the dung beetles and timed how long it took them to get their dung ball out of the stage area, first with visual clues and then without. The latter involved putting blinders on the beetles, as seen in the picture below. This part of the experiment made me glad I am not a dung beetle researcher. Anyway, to cut to the heart of the matter, the researchers found that the beetles could steer their dung balls straight (meaning they can get away from potential dung thieves quickly) under a moonless, starry sky but only if the Milky Way was visible. Bright stars alone weren't enough. This was tested both in the wild and in a planetarium. 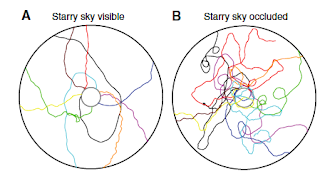 Here's a drawing from their paper showing these paths. On the left are beetle tracks under a Milky Way-lit, moonless sky, and the right are tracks made when the stars were not visible. That's a significant difference! In my opinion, this is really cool. We've known for a long time that animals can navigate long distances using all sorts of clever techniques, whether it be salmon finding their way back to the stream of their birth, arctic terns navigating from one polar sea to another, or Europeans off to exploit the wealth of the East Indies. So it is not surprising that even simple animals can use multiple cues to steer by. But still - beetles using a faint smear of light draped across the sky is a wild (and seemingly correct) idea. We shouldn't be too surprised that this technique evolved. The moon is not visible in the night sky half of the time, so being able to steer by another celestial light is a useful adaptation. And while the Milky Way is not always visible in the starry sky, the Milky Way is often visible when the moon is not, and vice-versa. Another neat finding is that the beetles cannot use bright stars to steer by. In the planetarium, researchers projected only bright stars, and the beetles were almost as lost as if it were a blank sky. I'd guess this is due to their poor eyesight being unable to detect the light of a single star. I once had to navigate by the light of the Milky Way. I was at Las Campanas Observatory in Chile at the time of the New Moon. It was the night before I was to start using the telescope, so I was in their library working one evening and I lost track of time. When I realized that it was night, I decided to walk back to my dorm room. But it was so incredibly dark, I couldn't see the sidewalk when I first came out of the library. Knowing that there was a pretty sizable and dangerous drop on one side of the walk, I didn't want to risk moving. Being an observatory, there were no walkway lights or outdoor lights. It was pitch black except for the stars overhead. As my eyes adjusted, I was happy to find that the light of the stars and the Milky Way was sufficient to light up the sidewalk, and I was able to walk easily and safely back to the dorms. Little did I know I was channeling my inner dung beetle! Dung beetles can navigate by the Milky Way. That's so cool!